I started this painting as a demo at the Birthplace of BC Gallery this past weekend. Just did a bit more tweaking to it at home this morning and I think it's done. I used three different photos for the crows, so I started with a life size sketch on paper to figure out the composition. The background was done intuitively and I didn't preplan it much, other than to paint quinacridone gold as the base colour and consider having light coming through the four corners. This is a fun and also nerve wracking way to paint for me. It can get overworked so easily- too busy, too muddy, too dark, too light. I did lots of glazes, wet-in-wet and edge softening with water. I allowed drips to happen and sometimes guided them with a small round brush. 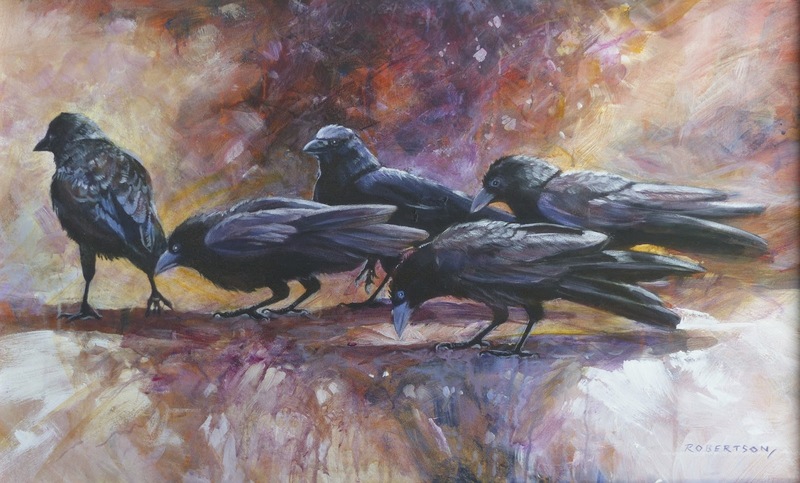 The crows, I painted with as much realism as I can muster. I like the contrast between the realism of the subjects and the abstract quality of the background.